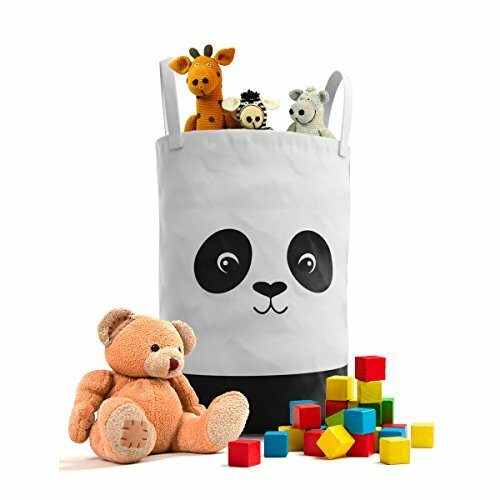 The Fawn Hill Co. Panda Laundry Hamper adds a beautiful touch to your children room or play room with lots of organizing options including: laundry, toys, blankets and pillows. With it's monochromatic adorable panda design, it is sure to be loved by your little one. The large laundry hamper is large enough to hold a large amount of items, making it very practical to store different items like clothing, toys, stuffed animals and much more. It is a great organizing basket for the Nursery, Bedroom, Bathroom, Bath Toys, Diapers and Gifts. ★ Keeps Children Room and your home neat and tidy. ★ Orginized Kids laundry, toys, blankets and pillows. ★ Adds to home Decor with these multipurpose bins. ★ Gives you peace of mind with a well-ordered home. ★ Panda Laundry Hamper is sturdy, reusable and recyclable. ★ Add a personal touch to your home decor with unique storage options. !00% Safe and Natural Strong cotton canvas with Perfect Size: 21"x 14" inches. Modern monochromatic Unisex Design: Perfect decor for nursery, playroom or children bedroom. Large and spacious: The perfect solution to many storage needs such as clothing, toys, baby products, pet toys and more. Easy to carry and move: The hamper includes two comfortable handles making it portable and easy to carry from one room to another. Cute panda pattern is specially designed for kids with collapsible feature. It is lightweight and portable for using, storing, and moving conveniently. If you have any questions about this product by FAWN HILL CO., contact us by completing and submitting the form below. If you are looking for a specif part number, please include it with your message.